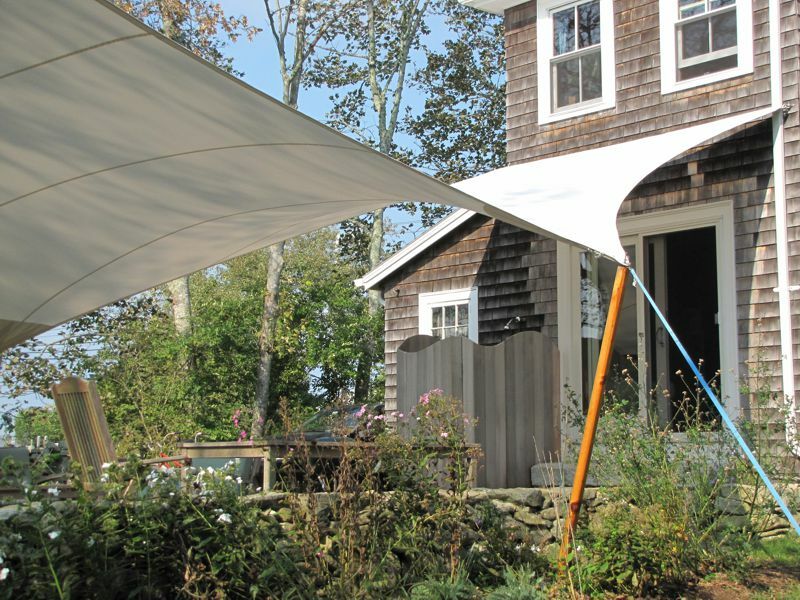 Tension awnings come in many shapes, sizes, and materials – especially if we are building them! Our custom residential awnings are tailored to suit the house and the customer exactly. This custom fit can be accomplished a few different ways, especially with an attentive, open dialogue between customer and designer. One important question that customers are sometimes too reserved to ask is: How can I order an awning without spending more than is available in my budget? 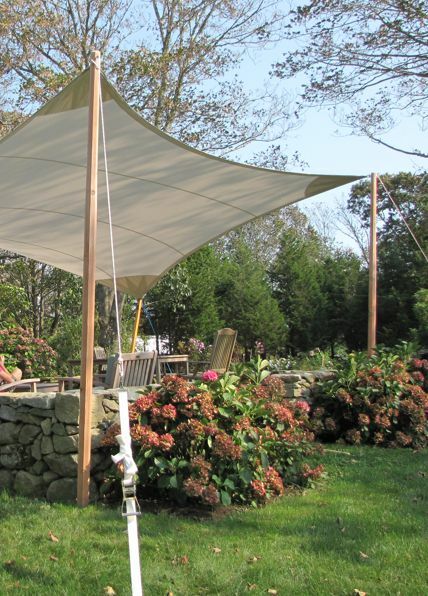 Shade is important, whether you want your awning to be a big investment or not. There are some surprisingly simple ways to prevent the cost of a simple awning from shooting through the roof, and we are happy to help our customers find what will work for them. A base of high quality cloth is very important, and should never be sacrificed. Happily, Sunbrella® Awning and Marine Fabric is the one we recommend most often and the cost per yard is far from exorbitant. With its high levels of UV and Water Resistance, Sunbrella® fabric has a fantastic cost-to-value relationship for a seasonal awning. The range of colors is impressive, with new releases every year (my personal favorite this season: pumpkin). We use the warm, inviting line of neutrals most often used for subtlety, but the colors range from pastels to brilliant jewel tones. For this particular awning, we made one small change that affects the overall appearance only slightly, but saved some money for the customer. Rather than tensioning with struts and stainless steel wire, the posts of this awning are supported by stakes and lines, with ratchet straps to make small alterations. Another set of variables that can affect cost in a big way are the wood and finish of the posts or spars. While some alterations will make small differences to the longevity of the awning accessories, it is possible to upgrade them in the future without any considerable hassle. Despite concessions made for price, this awning is beautiful, functional, and perfect for the patio space it covers. 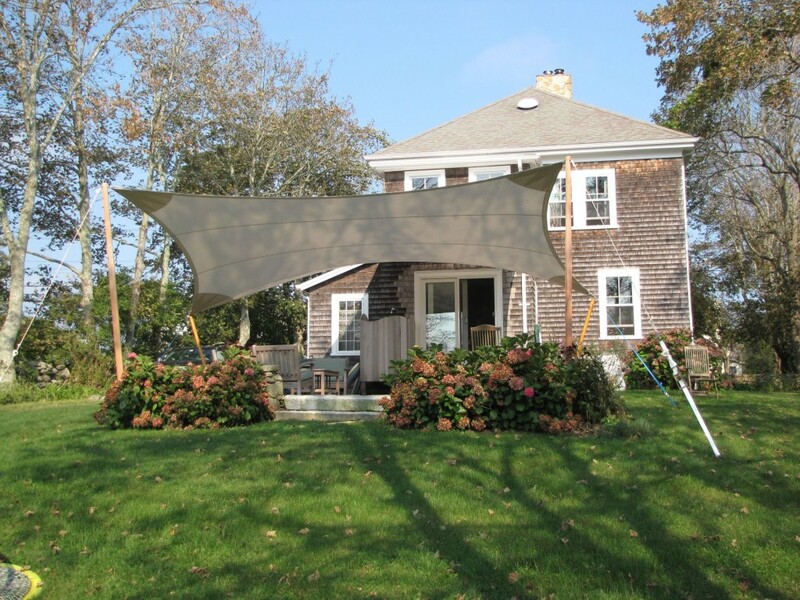 The Sunbrella® Awning and Marine Canvas is one of the best available for awnings and outdoor structures, and the company offers an impressive 10-year limited warranty. The bottom line is: if you are thinking about an awning, please give us a call! We will do everything we can to make your awning work for you. This entry was posted in Awnings, Tension. Bookmark the permalink.